Will Braydon Preuss' arrival hinder Max Gawn's scoring? 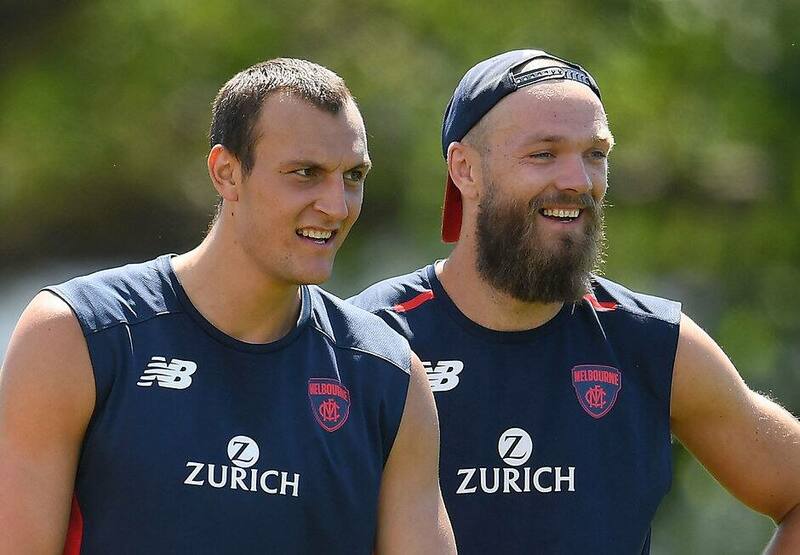 ONE OF the big questions of the off-season for AFL Fantasy coaches is whether Max Gawn (RUC, $808,000) will be worth starting with in 2019. The second best ruckman of last year, behind Brodie Grundy, was outstanding averaging a career high 111.3. Most Fantasy Classic coaches finished last season with the Grundy/Gawn combination and were keen to spend the big bucks on the duo from the get-go this year. That changed when Braydon Preuss (RUC, $342,000) made his way to the club during the NAB AFL Trade Period. Fantasy coaches are concerned what may happen to Gawn's numbers if he is sharing the ruck role. Preuss played eight games for the Roos in 2017 at an average of 67.3. His VFL numbers in the last two seasons have been sensational, averaging 47 hit-outs and more than 105 Fantasy points. If the Demons look to go with a two-pronged ruck set up, then coaches may wait and see how that looks before investing the $808K in Gawn. After starting the season in the VFL, Angus Brayshaw (MID, $763,000) took some time to get going with scores of 67, 53 and 78 from rounds four to seven, but quickly found his groove to be one of the best Fantasy defenders of 2018. A couple of huge scores (166 vs Adelaide and 133 vs Western Bulldogs) prior to the bye saw many coaches jump on while his price was low. He went on to average 105.1 for the season with a post-bye return of 115.9 points per game. Despite being named as MID only this year, Brayshaw is one of the Demons' best Fantasy prospects. Clayton Oliver (MID, $792,000) enjoyed an almighty second year breakout, taking his debut average from 68.9 to 101.6. In 2018, his third season, the 21-year-old scored the fifth most points of all players in the competition at an average of 109.1. Surgery on both of his shoulders has interrupted his pre-season, but from all reports he is tracking well for the JLT Community Series. It might be a big call to start with Oliver, but as last season's third highest scoring midfielder, there is a good chance he will be in your side at some point. Christian Petracca (MID/FWD, $585,000) has been gradually increasing his Fantasy output as his career progresses, but hasn't quite hit the premium numbers some coaches had hoped for. With eight scores of 90 or more, including a pair of 110s, Petracca has shown some signs of upping his game further and with continued improvement from Melbourne, 2019 could be the year that he is in the mix as a top-10 forward. Making the move from the Gold Coast, Kade Kolodjashnij (DEF, $585,000), alongside his former captain Steven May (DEF, $548,000), will help bolster the Demons' backline. Kolodjashnij may even push to fill a role on the wing to take advantage of his skilful outside game to complement the star-studded midfield. Only two seasons ago he averaged 85.8 thanks to a positive kick to handball ratio and 7.5 marks per game. The arrival of the Suns duo may help Michael Hibberd (DEF, $499,000) return to the form of his first year at Melbourne. Hibberd had a disappointing season averaging 68.8, a huge drop from his career high 92.6 in 2017. Corey Wagner (MID, $170,000) was picked up by the Demons during the pre-season supplemental selection period after playing with Casey in the VFL last year. The 21-year-old played eight games for North Melbourne from 2016-17, averaging 31.5 and 35.8 respectively, before being delisted. Keep an eye on Wagner as if he plays any game, he could be an ideal cash cow if he can replicate his stellar VFL form from last year. Wagner's last seven scores for Casey were 142, 91, 128, 91, 106, 105 and finally 87 in the VFL Grand Final. Could Jack Viney (MID, $604,000) be a value pick in 2019? A discount on his average of 91.4 prices him at 83.2 which is 18 points below his 2016 season. Two years ago Viney played 21 games at an average of 101.2. Matching that return would see him make some quick dollars and give you a nice stepping stone to a premium midfielder, but Viney is unlikely to be a keeper. The best value may come in Fantasy Draft for those who can grab him late and plug and play him off the bench when needed. Jordan Lewis (DEF, $575,000) has experienced a decline in Fantasy numbers over the last four seasons. From the highs of a 110.7 average in 2015 in Hawthorn's three-peat winning year, he dropped to 103.2 in 2016 before moving to the Demons for 88.8 and 78.3. With the veteran turning 33 early in the season, Lewis' best Fantasy days are behind him.